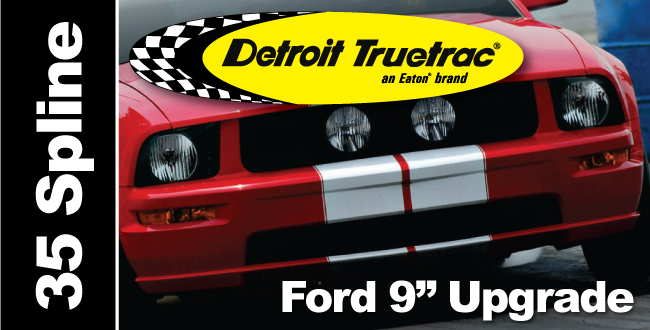 The Detroit Truetrac for the Ford 8.8”- 33 Spline is ideal for upgrading existing Ford 8.8” axles (1983 – 2011) as well as custom powertrain builds. The Ford 9 Detroit Truetrac 35 Spline is perfect for use in Ford 9″ axle applications that are being upgraded from 28 or 31 spline to 35 spline. This unit is also ideal for custom powertrain builds. The 5-pinion design of the Ford 9 Detroit Truetrac provides incredible strength, smooth maintenance-free performance and proven durability. Available NOW!! 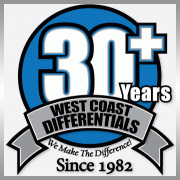 Call the differential experts at West Coast Differentials for more information. Representatives are available to help Monday thru Friday from 8am to 5pm Pacific Standard Time. 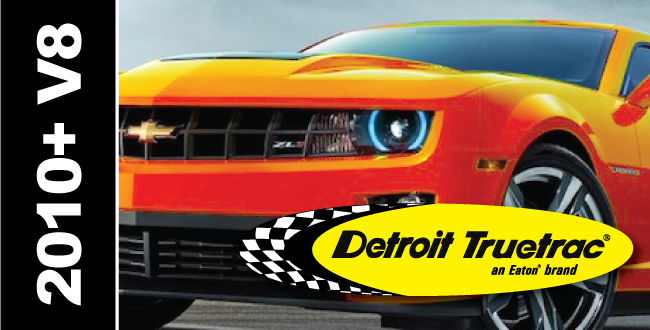 Check out the Detroit Truetrac FAQ’s page for more information. 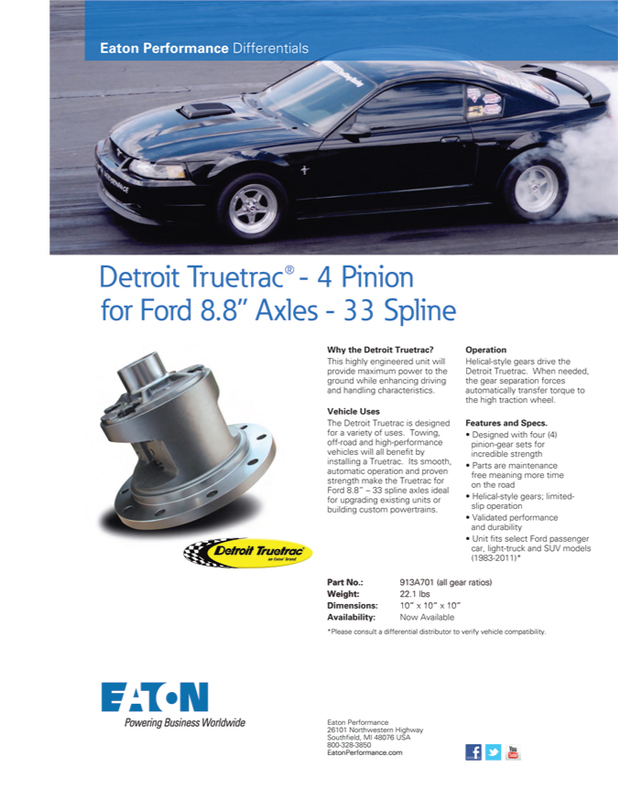 Eaton Performance Products has announced the new Detroit Truetrac for AAM 10.5″ (GM 14-Bolt) Differentials! This differential is commonly found in 3/4 and 1-Ton GM Trucks and commercial vans.The proven helical gear design of the Detroit Truetrac eliminates the need for wearable parts, resulting in maintenance free traction recognized not only for its toughness, but its smooth and quiet operation as well. Proven design, low cost and effective performance all make the Detroit Truetrac limited slip differential the ideal choice for a wide variety of vehicle applications. No maintenance – Just Traction! The 2010+ V8 Camaro uses a 10-Bolt GM 8.6″, & 218mm axle. 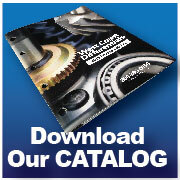 West Coast Differentials offers an variety of Chevrolet Camaro differential and axle parts for 2010 and newer V8 Models. Available parts include the AAM TracRite PC Limited-Slip Differential, Eaton’s Detroit TrueTrac, Ring & Pinion Gear Sets, Bearings, Install Kits & Seals. The AAM TracRite PC (Plate Clutch) Traction Enhancing Differential is configured to bias torque to the high-traction wheel, based on torque input. Another available option is Eaton’s Detroit TrueTrac, a maintenance-free helical gear type limited-slip differential. Available ring & pinion gear ratios include 3.08, 3.23, 3.27, 3.45, 3.73 and 3.91. 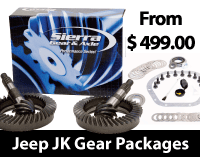 Jeep JK Gear Packages Ring and Pinion, Lockers Axles & More. Get the Right Differential Gear Ratio at the Right Price! Add Locking Differentials, Limited Slip Differentials or Chromoly Axles to your JK Gear Package and . We have lots of options available. If you don’t see what you’re looking for, give us a call! Upgrade your Ring and Pinion Gear Package for added savings! Go from open to fully locked with the flip of a switch. Multi-function recalibrator for Jeep JK owners. Recalibrate for Tire and Gear Ratio changes, Speedo Correction, Shift Points and More! A must for 2012 and newer ratio changes. Complete with a 10-year Warranty! * Prices subject to change without notice. Prices for upgrade items apply when ordered with Gear Packages only. Substitutions will effect final package price. Contact our sales department for details. Shipping not included. The Eaton Posi is the perfect way to control traction in street rods, light duty pickups and everyday drivers. The Eaton Posi prevents wheel slip before it can get started. To do that, carbon disc clutch packs, preloaded by a central spring assembly, are located behind each differential side gear. When torque input increases the clamping load on the clutch packs increases. That causes the chatter-free clutch packs to grab and transfer power to the other wheel. The Eaton Posi is fully rebuildable with one of our specially formulated clutch kits. Muscle cars, hot rods and mild offroad vehicles should look to Eaton’s limited-slip differential for their traction answers. And the fact is, Eaton’s Posi units are virtually bulletproof. Not sure which Locking Differential or Posi is the right one for you? No problem! Our Differential Professionals are here to help Monday thru Friday, 8am to 5pm Pacific Standard Time. 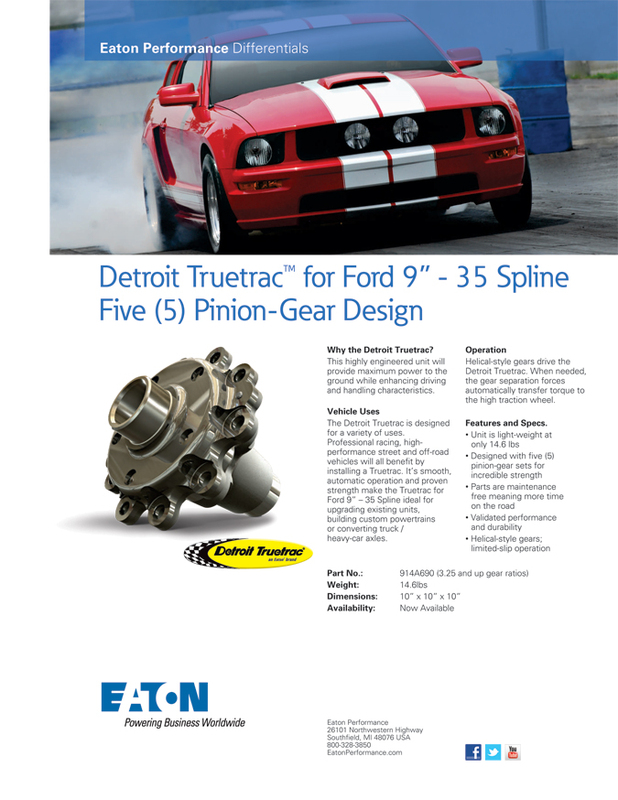 Eaton’s Detroit Truetrac was the first helical gear differential ever introduced into the automotive aftermarket. 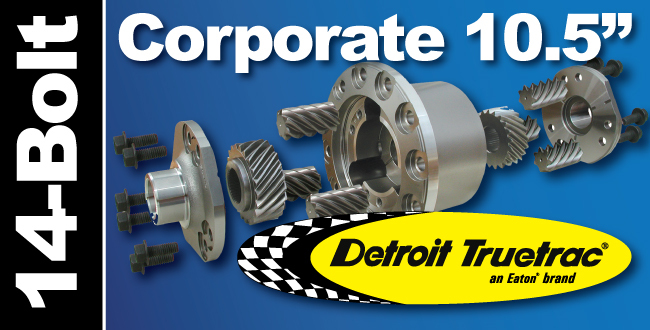 The Detroit Truetrac remains the leading gear-type limited slip differential in the industry. Detroit Truetrac’s proven design eliminates the need for wearable parts, resulting in maintenance free traction. Recognized not only for its durability but also it’s smooth and quiet operation. Engineered to work efficiently in front and rear axles, semi-floating (C-clip axles) and transfer cases. Power transfer is so smooth, it literally goes unnoticed by the driver – even in front wheel drive axles. Proven design and effective performance, all make the Detroit Truetrac limited slip differential the ideal choice for a wide variety of vehicle applications. No maintenance – Just Traction! Performs as an open differential until you decide that you need more traction. Eaton ELocker is your push button solution to almost any traction problem. The Detroit Locker is a 100% Automatic, Wheel Speed Sensitive locking differential that provides Legendary Traction and Unmatched Durability! The professionals at West Coast Differentials are the Detroit Locker experts! We will make sure you get the ideal locking differential or positraction for your vehicle. We also match any legitimate competitor’s advertised in-stock price, and make sure you get the locker that fits your vehicle and your performance needs. Most applications are IN STOCK and READY TO SHIP same day! We also stock Eaton Posi Limited Slip and E-Locker Service Kits. What kind of oil should I use? Can I use synthetic? Do I need friction additive/modifier? A quality petroleum/mineral based oil works best in the Detroit Locker units. We do not recommend synthetic oil. Friction additive/modifier is not required. Can I use the stock bearings? In most cases the Detroit Lockers work with the factory (stock) bearings. The exceptions are: 10 bolt 8.5\8.6 GM axles, the “Performance” Dana 35 & 44 and GM12 bolt with 35 spline axles. No other “special” setup is required. What kind of break-in is required? The Detroit Lockers do not require any break in. When does a Detroit Locker lock? The Detroit Locker is locked up 100% in a straight line or if you are spinning. The unit unlocks in a turn for the wheel that is turning the fastest. When I step on and off the gas pedal, I hear the unit make a “clunking” noise. Why? Because Detroit Lockers have “backlash” or “slack” between the drive and driven teeth and you will hear this in everyday use going through corners and when going from drive mode to coast mode. Also with the vehicle on the ground and the transmission in neutral you will have 1\4 to 1\3rd of a turn of lash in the driveshaft, this is completely normal. Can I run a Detroit Locker on the street? Many people do use the Detroit Locker during everyday street use. The Detroit Locker is a very aggressive differential, so you will hear it and feel it everyday on the street. Eaton makes many applications for trucks that spend most of their lives on the road. (In the late 60’s, some Ford cars had the Detroit Locker as a factory option.) How much horsepower and torque will the Detroit Locker take? There are many factors to consider when determining if a specific differential will last in your vehicle. Horsepower and torque are important factors. However, the weight of the car, tire height/width, the terrain and suspension are all important things to take into consideration. For example, a setup that uses street tires will live longer because both tires will break loose and spin before any real strain is put on the unit. But as the tire gets wider, the stress on the unit increases because the traction is greater. When in doubt, the best bet is to call us with your specific application and driving conditions. But also keep in mind that the Detroit Locker is the strongest unit sold today and has been for many years. Can the Detroit Locker be used in the front axles? Yes they can, but you must have lock out hubs and they MUST be unlocked for on- road driving because of steering issues. Can the Detroit Locker be repaired? Yes they can. 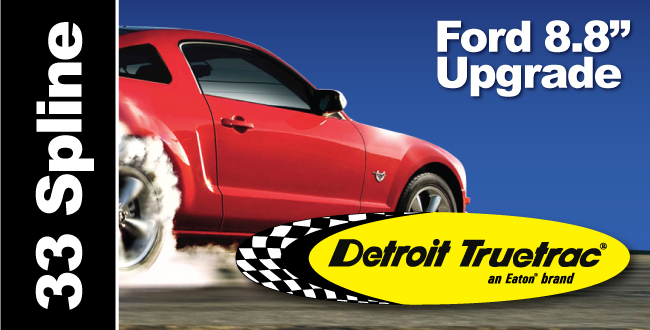 Should you need to repair a Detroit Locker parts can be purchased from any of our dealers. Call Eaton Customer Service so we can provide a blow up of the unit that shows all the part numbers and help you find out exactly what part numbers you need to purchase. At that time we can even recommend a company to buy the parts from. What is the warranty? The Detroit Locker unit is covered for one year from date of purchase against defects in materials and workmanship. The unit is not covered if the failure of another part (axle shaft or ring & pinion) damages the unit.